Consider the nectarine. It gets no respect. 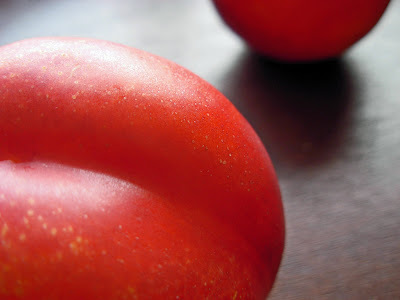 Virtually identical to the peach, its clean-shaven curves and sweetly tangy flesh have never earned American cultural kudos. Has the nectarine EVER been celebrated in a collection of colloquialisms like peachy keen, peaches and cream complexion, peach fuzz and just peachy? 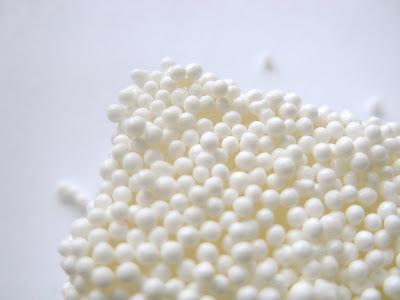 Has it EVER been the key ingredient in a famous dessert? Has it EVER had a song named after it? Even the tangerine has spawned a handful of memorable tunes over the years. I am just as guilty of this slight as any of us. I’ve made pit stops at the peach bins in farmers’ markets, reached for the canned peaches on grocer’s shelves, and carpooled to the countryside to pick peaches from ancient orchards. In all fairness, though, it is difficult to find an admirable nectarine recipe anywhere. There are plenty of variations of peach pies, cobblers and ice creams, but I had to dig very deeply to find one that would showcase the two flushed, golden orbs casually arranged in my fruit bowl. While I could easily have just switched out the peaches in any of the recipes, I did hold fast to my commitment to elevate the nectarine to its greatest glory. It was a given that a Chez Panisse creation would fit the bill: split, plump fruit halves, stuffed with cake crumbs and nuts, stewing in their own syrupy, rosy juices. I think you will agree, for a nectarine, this is one peach of a dessert. Arrange nectarine halves in a baking dish, cut side up. In a small bowl, cream butter with sugar until fluffy. Beat in egg yolk, then stir in remaining ingredients. Divide mixture evenly among nectarine halves, lightly mounding it into center of each with a small spoon. 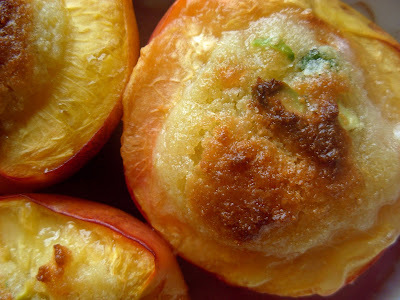 Bake on center rack of oven for 30 minutes or until nectarines are plumped and juicy, and the stuffing is browned. This post is being submitted to Jeanne of Cook Sister!, one of the hosts of the popular Waiter, There's Something in My... This month's event features the theme of stuffed fruit or vegetables. You can catch the full round-up here. Nearly everyone knows that salmon is good food. High in omega-3, heart-friendly acids, protein and antioxidants, is it among the world’s healthiest fish products. It is, however, also one of the most confusing purchases ever to be made. Not all salmon is created equally, at least not since humanity developed a proclivity to mass produce food in the same manner as cheap toys in cereal boxes. This is good for neither man nor salmon. Since the discovery and promotion of salmon’s many health benefits, consumer demand has skyrocketed and consequently depleted the supply of the finest salmon, the wild-caught. Salmon living as nature intended, on their own, catching their own wild-caught suppers, are significantly less inclined to carry pollution in their flesh than those raised in penned farms. Farm-raised salmon, now predominant on the market, are routinely fed a diet high in dioxin and PCBs, toxins of particular risk to women of child-bearing years, although no one is exempt from the health implications. All this can be pretty disheartening and worrisome to the health-conscious consumer, but if we are willing to take note of a number of savvy pointers, there is no reason why we can’t have our salmon and eat it, too. Bring large pot of water to boil. In a large skillet, sauté chopped shallot in butter over low heat until translucent and tender. Add pasta to boiling water pot. 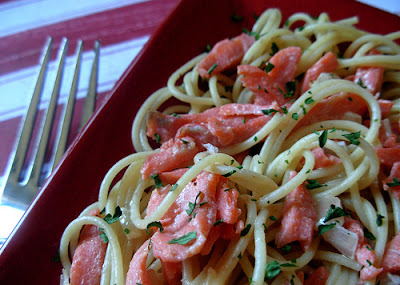 While pasta is cooking to your desired tenderness, add salmon strips to the skillet, heating on continued low heat until salmon becomes pale. Add white wine and cook for ½ minute. Add half and half, stirring to heat through. Remove from heat. Drain pasta and divide onto two plates, spooning sauce over pasta. Scatter lightly with parsley and black pepper. * You can virtually cut out all saturated fat by substituting olive oil for the butter, and non-fat half and half for the richer version. This post is being submitted to Ruth of Once Upon a Feast, the creator of the weekly food blogging event, Presto Pasta Nights. 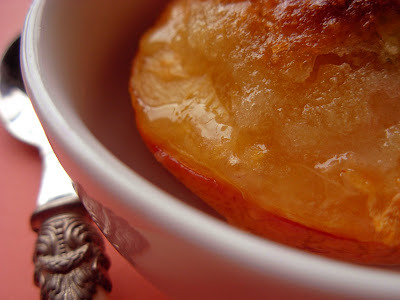 Ruth posts a round-up of recipes from all over the world every Friday. My very first taste was from a charming round wooden box some years ago. Underneath its chintz-covered top, arranged in a delicate crush of tissue paper, lay a snug and generous cluster of jelly cubes, heavily dusted with powdered sugar, their pink and yellow colors peeking through at the corners. These were no ordinary gumdrops, nor strip of neon colored and flavored bars, but something romantic, mysterious and exotic. These delectable gummy squares were Turkish Delight, and I have been in love every since. From the Arabic, rahat lokum (“soothing to the throat”) has been around since ancient times. 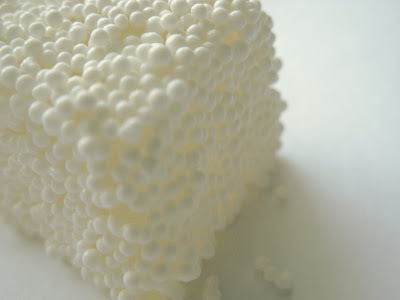 Traditionally perfumed with rose water, lemon or mastic, it holds a special place in many British childhoods as well as Middle Eastern cultures. It is no wonder Edmund Pevensie sacrificed his siblings’ welfare when the White Witch enticed him with it in “The Chronicles of Narnia.” Much the same happened to Esau when he sold his birthright for a bowl of lentils in The Bible. I can see that happening. Good stuff has its price. I had my price to pay, too. Never popular here in the States, Turkish Delight can rarely be found outside of Middle Eastern grocers and bakeries, all of which are inconveniently located (at least for me). The few boxes I did manage to find were afflicted with the same artificial colorings or equally crass flavoring agents of the cut-rate sticky American sweets. This called for taking matters into my own kitchen. Candy making is not for the faint of heart. Everything goes wrong, particularly if you’ve little experience or only a modicum of patience. Setting sugar to boil turns the same innocuous, beloved sweetener you anoint your cup of tea with into a raging mess that likes to spatter you with second-degree burns. Recalling my many failures, but buoyed by a handful of successes, I studied many recipes. The bulk of them were arduous missions of meticulous coordination, exacting equipment and impeccable timing. I looked for an easy way out, and found it in a streamlined rendition requiring little time and only one saucepan. It was not to be. Three hours later, I had a plate full of thick, loose taffy that stubbornly refused to set. I excised a piece out of it, only to have the breach filled in without a trace in half a minute. It was alive, but behaving very badly. After much unsavory muttering, I cut my losses and tried again, this time taking the long way home. Turkish Delight, my dear Edmund Pevensie, is not child’s play. Covered in traditional powdered sugar and cornstarch. In a 9 inch baking pan, grease the sides and bottom with vegetable oil or shortening. Line with wax paper and grease the wax paper. Combine cream of tartar, 1 cup corn starch and remaining water in saucepan over medium heat. Stir until all lumps are gone and the mixture begins to boil. Stop stirring when the mixture has a glue like consistency. Once the mixture has become a golden color, stir in rosewater. Pour mixture into wax paper lined pan. Spread evenly and allow to cool overnight. 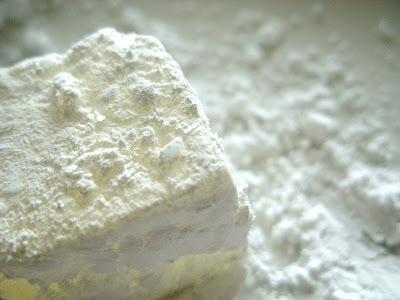 Once it has cooled overnight, sift together confectioners sugar and remaining cornstarch. Turn over baking pan containing Turkish Delight onto clean counter or table and cut with oiled knife into one inch pieces. Coat with confectioners sugar mixture. 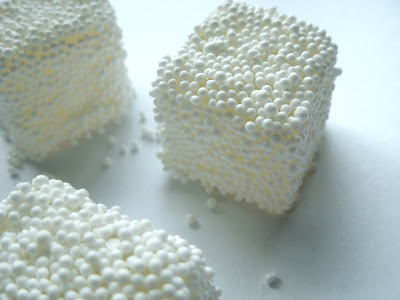 [ I used nonpareils white candy shot on some cubes.] Serve or store in airtight container in layers separated with wax or parchment paper. This post is being submitted to Tara of Seven Spoons, host for this month's Sugar High Friday event. UPDATE: This post is also being submitted to Ayse and Minik of I Love Turkish Food for the Turkish Night event on September 1. 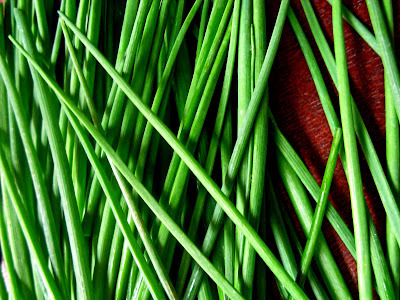 Another unsung hero of the culinary world, relegated to living on the fringes as a garnish or flavoring flourish, chives deserve much more of a spotlight than their history or current status demonstrates. Chives are a part of that famous Barrymore family of allium, whose other members are onion, leek and garlic. These fine, thin straws of bright-eyed green can rightly feel the pull of the green-eyed monster as they are snipped yet again and tossed carelessly on a sour-cream besotted baked potato. Outside of infused oil or a pesto ultimately dominated by parsley’s muscle, few recipes try to improve chives' rank in the food chain. It became apparent that if I was going to feature this slip of an onion, I would also have to get out the scissors like everyone else and start snipping away. There was, however, no reason not to improve its odds by strength in numbers. Once a recipe receptive to manipulation was found, I made my vow not to leave even one tender blade behind in the colander. A handful became two. A star was born. In a large bowl, combine the flour, poppy seeds, salt and pepper. Depress flour with your knuckles to form a well. Pour milk and add eggs into the well, then beat vigorously with wire whisk until fully blended and smooth. Stir in chives. Prepare large skillet with butter, oil, or non-stick cooking spray (particularly critical if using natural finish cookware; crepes will stick and tear). Heat skillet over low-medium burner, then pour approximately ½ cup batter in skillet, quickly spreading it in a circular motion with the back of the cup from center of the skillet toward edges. Cook for approximately 1 minute, then turn to cook other side. Remove each crepe to a plate, allowing to cool slightly. Spread some filling on each crepe. Either roll crepes individually or stack them. Crepe batter thickens very quickly. If you prefer rolled crepes, add extra milk for thinner batter. Thinner crepes are much easier to roll. 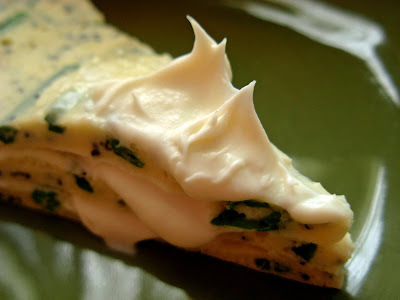 Photo shown is a wedge cut from stacked, thicker crepes. This post is being submitted to Rinku of Cooking in Westchester. Rinku is hosting Weekend Herb Blogging, a weekly food blogging event, for the event's creator, Kalyn Denny of Kalyn's Kitchen. Though everyone either snickered or questioned my sanity, I had every intention of baking my own cake for my wedding last year. Months before the great occasion, I would walk a new test creation to the office every week, dangling a cake box as if it was a parrot in a cage. The cakes were a great hit. I was exhausted. Two weeks before the wedding, I walked myself right into a bakery and ordered the cake. The best meal of my life. Enjoyed with my family when I was around eleven years old at a beaten up seafood shack, precariously poised on a pier jutting over the Atlantic at the Jersey Shore. We were very sunburned and sandy, gathered around a big table crowded with fried clams and shrimp. With the waves literally crashing beneath our feet, and the steady breeze whipping across the water, we were lulled into a place of perfect tranquility and bliss. I have deliberately passed up restaurants billed as among the finest in the city in favor of Cuban rice and beans on the East Side, a thick panroast at the Grand Central Oyster Bar, or falafel downtown. If given a choice of seating in a restaurant, I will always prefer a table tucked into a corner or a booth. Some years ago, I played hooky from work and took off with a friend up the Hudson River Valley. After spending hours roaming the historic Roosevelt and Vanderbilt estates, we wound up at the CIA (the Culinary Institute of America, not the other one), where we enjoyed an excellent late lunch amid all the chefs in training. I was memorably impressed by the hard work, hospitality and enthusiasm these students shared with us in one of the several charming and well-run restaurants on campus. Since my mother and I knew we weren’t going to Paris any time soon, we embarked on the extravagant baking expedition known as gâteau Saint-Honoré. Sharing a kitchen, we worked in shifts all through the night, taking turns filling and gluing the cream puffs, sipping tea, and napping on the couch. It was a raging success. I have not made pâte à choux since. No matter how slopped up I get, I have never outgrown my love of eating in the car. Since before I can remember, my grandfather would load us up in his tiny box of a black sedan and take us on road trips into the countryside. Invariably, we would wind up at Mom and Pop burger or hot dog joints along the way, with one final stop at an ice cream stand. These spots are long since gone, but I still remember the tangle and smell of a pile of fries in one hand and the feel of the soft bun of a burger in the other. Christina, Cynthia, Riet, Anne, Shn, Dani, and Jenn! There are few sweets of my predominantly German-American heritage that give me more of a feeling of contentment and coziness than gingerbread. I am the first one to dismantle the Bahlsen’s lebkuchen display at the grocery store after it’s been set up for the Christmas season. I am also the first one to make the supreme sacrifice of volunteering to polish off that last piece of treacle-stuck Yorkshire parkin. Europe, particularly Germany and England, have a long, convoluted, folkloric history with ginger as far back as the Middle Ages. Even if you are unfamiliar with the cooking in these countries, you may know a gingerbread man when you see one. For those who are very familiar, the gingerbread house in the very grim Grimm Brothers fairy tale, “Hansel and Gretel,” will ring a heartfelt, if not macabre, bell. Firing up the oven was the furthest thing from my mind as New York moves closer to summer’s heat, but I am reminded that not everyone on our planet is enjoying the same soft spring weather as we are at exactly the same time. Gingerbread is all about the fall, when leaves color and crisp, and a gratin can be found bubbling and browned. It is all about the warmth, too, and the warmth will be always welcome in my home, any time of the year. Fill greased or paper-lined mini muffin pans 3/4 full. Bake for 10-12 minutes on center rack of oven or when toothpick inserted comes out clean. After 10 minutes, remove muffins from pans. In a small bowl, stir together the powdered sugar and milk until sugar is fully dissolved and icing in smooth. Arrange muffins on a grid over a large pan to catch drips. 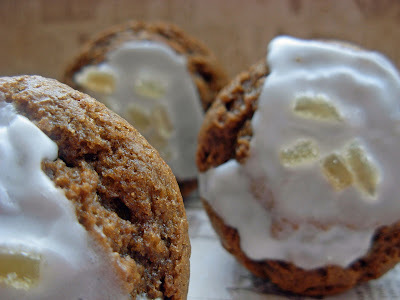 Pour 1/2 teaspoon icing over each muffin, then top icing with a few bits of minced ginger. Icing with harden within 15 minutes. * Black pepper is also used in pfeffernüsse (peppernuts) another famed German spice cookie. This will enhance the spiciness overall, but will not be uncomfortably hot. 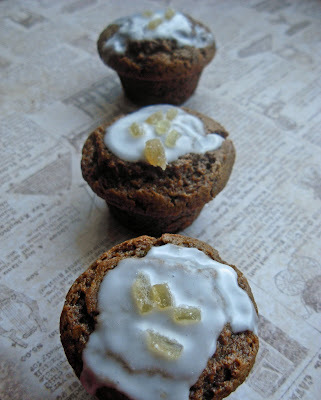 This post is being submitted to Gourmet of un tocco di Zenzero, who is hosting Muffin Monday 03 - Spicy! for Elena Ho of Experiments, the creator of the Muffin Monday food blogging event. Don’t get me wrong. I like beets. I like them a great deal. But in order for me to like them a great deal, I have to do a great deal to them. The classic American sugary pickled beets leave me as cold as they are. I like borscht better than pickled beets (and have a bottle of concentrate from Poland to prove it), but better still is a recipe that downplays the sugar beet’s historical significance as a sugar fix. Deprive a sugar beet of its will to go all sticky and sweet on you, and you will have the flashing flavors of vinegar, garlic and herbs having their way with what I consider the earthiest vegetable around. Raw beets smell like dirt and they taste like dirt. I’m convinced the beet’s tap root is as curled as a rat’s tail in order to anchor it in the soil; it’s not going to be dug and pulled up without a fight. 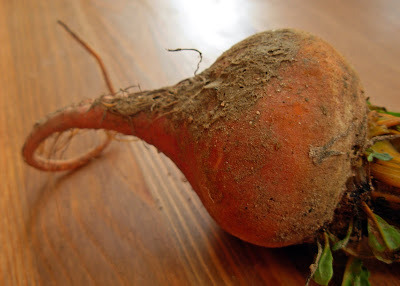 Once a beet is harvested, it doesn’t want to loose its characteristic rankness, either. 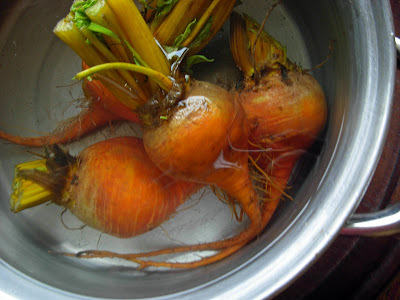 The golden heirloom beets I purchased were so filthy that it took several changes of water and a good scrub to make them presentable for this recipe. Yet when they were boiled and dressed in a simple, but delicately complex sauce, they were ready to star on my best French porcelain plates. How exactly this transformation comes to pass, I will never know. Beats me. Cover beets and garlic cloves in water in a large saucepan. Boil until beets are tender, about 40 minutes (microwave directions in original Epicurious recipe above). Remove vegetables from saucepan and set them aside to cool. When cool, squeeze garlic cloves out of their skins, then mash them in a bowl with the back of a spoon. Add olive oil and vinegar, mixing well. 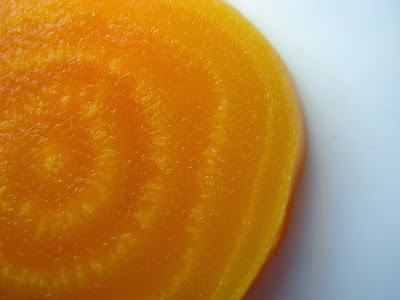 Peel beets and slice into rounds about ¼ inch thick. Arrange beet slices on small plates, spooning garlic dressing over them. Divide and scatter the scallions, cilantro and walnuts over each plate, finishing lightly with salt and pepper. This post is being submitted to Pat of Up a Creek Without a Patl, who is hosting Weekend Herb Blogging for Kalyn Denny of Kalyn's Kitchen, creator of the Weekend Herb Blogging event. Of course, there are so many more things we all depend on and take for granted, but if I was ever stranded on a desert island, I think I could get by on these...but then, I would have much more pressing issues, like finding potable water, lighting a fire and foraging for food. Not having a frying pan would be the least of my troubles. What would YOU choose as your five essential survival tools? 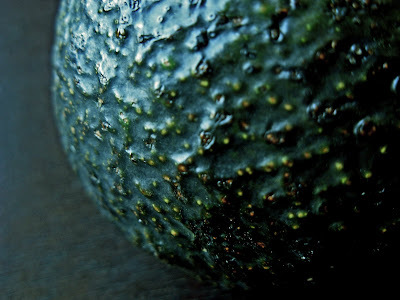 The Alligator Pear, more commonly known as the Avocado. I could never live in the tropics, as gorgeous as they are. I am so accustomed to the four uniquely beautiful seasons I enjoy now that my circadian rhythms would be permanently derailed. As much as I love the bounty of summer, by the time Labor Day rolls around, I am wilted by its heat and humidity, ready for the cooler breezes skimming my tanned arms, and the idea of airing out big, fuzzy sweaters from the cedar chest. It is impossible for me to imagine how anyone could live in Florida year round, where residents lock themselves into air-conditioned homes during sunlit hours to escape the punishing temperatures and stickiness. So when the time came for me to meet my future mother-in-law, who lives on the Gulf coast, we sensibly timed our trip for February when every one is running away from the cold towards the equator. Florida did not disappoint me. I marveled at all the outstanding local color, the palm-lined streets and dazzling marina of St. Petersburg, the touristy, goofy sponge-diving docks of Tarpon Springs, and the enchanting visit to Homosassa Springs Wildlife State Park where you can watch the two-ton manatees eat two tons of vegetables from an underwater observation tank. Flamingos, Florida's finest. 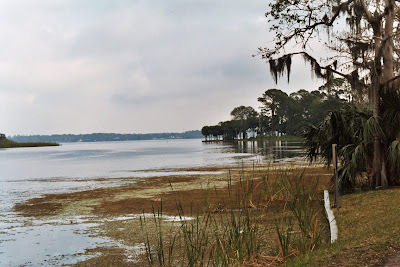 Homosassa Springs Wildlife State Park. Compound at Homosassa Springs Wildlife State Park. Anderson Park, home of alligators without borders. Florida’s wildlife fascinated me, but it also frightened me. It wasn’t until we visited Anderson Park not far from our hotel that I truly felt the fear. 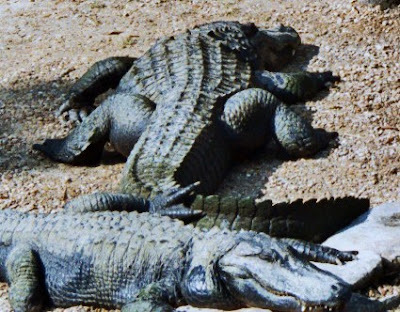 We were in alligator territory, after all, sitting at the bay's edge unprotected. The park was posted with several signs warning, on pain of fines, not to harass the reptiles. I wondered if there were signs facing dry land, warning the enormous, powerful beasts not to harass the people who were not too terribly interested in sacrificing a limb to the jaws of a creature looking for a spot of lunch. I’m having a spot of lunch now myself, a creamy soup made of avocado, also known as alligator pear. 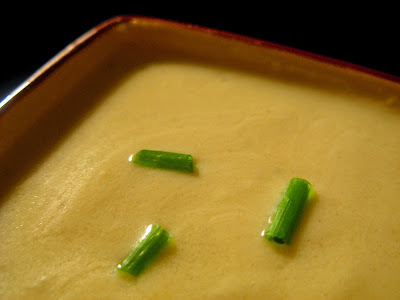 It’s a delicious and easy soup, served either hot or cold. More importantly, it’s a safe soup. I am free from both fear and fine. In a large saucepan cook the shallots over low heat in the butter or oil until partially softened, about 10 minutes. Add stock, salt and pepper to shallots and cook over medium-low heat for 20 minutes. Transfer to blender and puree. Add avocado and puree until smooth. Return mixture to saucepan, adding half and half or milk. Barely heat through, then remove 1/2 cup of the soup, adding the lemon juice to it. Return the soup with the lemon juice. Stir gently to mix. Ladle into soup bowls. Garnish with optional snipped chives. This post is my contribution to Meeta's Monthly Mingle - Spring is in the Air, which she is hosting at her lovely site, What's For Lunch, Honey? There is a list of certain foods that Scott, my husband, absolutely will not eat, the reasons of which are as complicated, mundane or unfathomable as anyone else’s culinary peccadilloes. Quite possibly this is the shortest list of verboten victuals ever known to me. But it is a list nonetheless, one which I take very seriously, not only because the customer is always right, but because you want the customer to have seconds, thereby minimizing the risk of too many leftovers that you couldn’t possibly eat all by yourself no matter how much you’d love to. Considering how short the list is (eggplant, fin fish, cabbage), you would think I’d just shut up and work around it, confining my consumption of items on the list for when we aren’t dining together. For the most part this does work, but there are occasions when one’s culinary creativity feels cramped, or the cravings for an offending item crop up when you are just snapping on the stove burners and getting out the shiny blades. These are the times when you can exercise the equally unfathomable loopholes, when eggplant gets a pass in moussaka, but not in ratatouille, and when fish cakes are friendly, but a slab of fried flounder is a fiend. 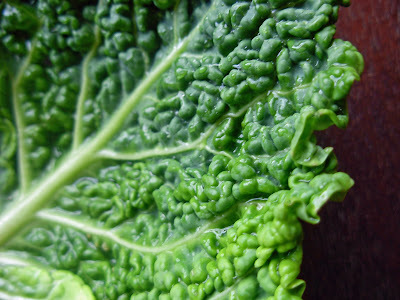 Remarkably, cabbage gets the green light, too, sometimes, but only when it’s very green, very clean and very new. 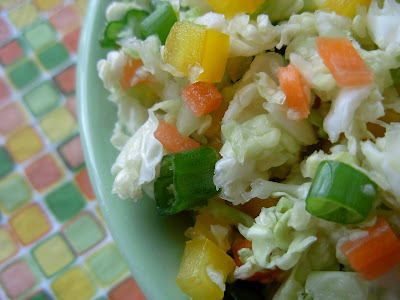 Why cole slaw makes the grade, I will never know, but I’m not quibbling, I’m celebrating and about to toss a bowl full of confetti, cabbage confetti with home-made dressing, to go with the fish cakes. Combine vinegar with sugar and salt in small saucepan, heating until sugar is dissolved. Set aside to cool. Remove outer, darker and soiled leaves from cabbage. Cut off stem end and part of core, but it’s unnecessary to completely core the head. Wash cabbage under cold running water, checking inside the looser leaves for an insect or two. 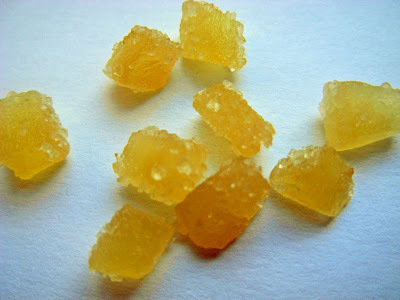 Coarsely cut the head into cubes approximately 2 inches overall and place cubes in a blender. Fill blender with cold water, fully covering cabbage cubes. Pulse blender until cabbage shreds and chips into confetti, taking care not to over process; over processing causes mushy results. 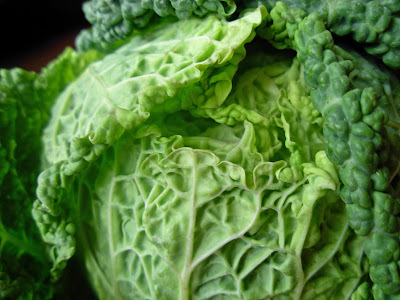 Drain cabbage in a large colander or strainer. Since the cabbage itself will release a lot of its own water, you can reserve the liquid for a vegetable stock if desired. Allow cabbage at least 15 minutes to drain. In a large bowl combine the drained cabbage with the other vegetables. Pour dressing over slaw, mixing well. Set aside for at least ½ hour for flavors to develop. This post is my submission for Weekend Herb Blogging # 81, being hosted this week by the creator of the event, Kalyn Denny of Kalyn's Kitchen. I am one of those people who does not have a favorite color. I’ve owned two cars in my life; one was cobalt blue, the other is silver. If you look in my closet, you will see a kaleidoscope of hues without any law or order to them, except, of course, the predominance of black, not as a favorite, but as a prerequisite uniform for working in New York City. Call me indecisive or greedy, but I pretty much like all colors for one quality or feeling or another. I’ve taken any number of pop quizzes on color in magazines and online, and the anything-but-pop Lüscher Color Test, which puts so much exacting analytic gravitas on your choices that you need to check in with a psychiatrist to figure out what it all means. Then you have the study of color theory, that behemoth science of light spectrum that takes you to task for using the “wrong” colors together as if your whole world will explode if you do. If pushed very hard, I would have to select but one color that seems to rally above all others. This color’s merit is particularly powerful as it literally shines and coaxes the dismal, grey landscape of waning winter days into the next season. Spring offers pinks, whites and purples, both restrained and riotous, but it is yellow, always yellow, that chases the clouds from the sky and reminds us, after months of dormancy, of life’s essence, warmth, cheer and light. 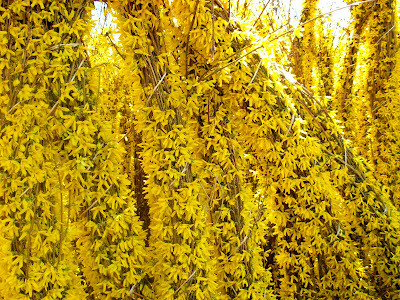 Bundled, blooming forsythia wait for new homes at a nursery. 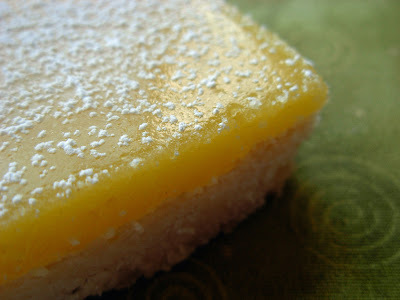 When Easter proved to be wind whipped and weeping with showers, a lemon curd cheesecake saved the day. It was a given that I would return to Rose Levy Beranbaum’s incomparable lemon curd recipe with a yellow so dramatically saturated, one suspects artifice dropped from a tiny plastic bottle. The world is full of metals, clays, and gems that are ground into pigments for a painter’s palette, but there is other natural artistry at work every time an egg is cracked, its golden yolk spilling nourishment, sunshine, light and hope on the canvas of our days. In a large bowl, cream butter with the sugars until light and fluffy. Add all the flour to butter and mix quickly with fingers until dough compacts into very large, loose crumbs with all the flour absorbed. Do not be concerned that the dough does not form a ball. Empty dough into an 8 inch by 8 inch metal baking pan that has been lined with aluminum foil (do not grease the foil) long enough to extend beyond pan from one side to the opposite. This will serve as the handles to easily lift the shortbread from the pan after it has cooled and is ready to cut. Lightly and evenly press and pat dough into pan. Prick dough all over with a fork. Bake on center rack of oven for 35 minutes or until dough is biscuit golden but not browned. 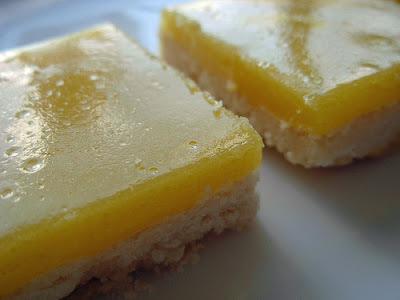 Remove from oven and lower oven temperature to 300 degrees F. Pour and smooth lemon curd (recipe follows) on top of shortbread, returning it to oven to bake for 10 minutes. Remove from oven and allow pan to cool completely before transferring pan to refrigerator, chilling a minimum of ½ hour before carefully lifting shortbread from pan to a cutting board, keeping foil intact. Carefully cut shortbread into squares with a long knife. The lemon curd will cut clean since it has had time to set. Dust squares with powdered sugar (optional). While shortbread is baking, beat the egg yolks and sugar in a non-reactive medium saucepan. Add lemon juice and butter. Over low-medium heat cook the mixture, continuously stirring. It will slowly thicken and become more yellow and opaque as it cooks. It must not be allowed to boil. If the saucepan steams, remove from heat and continue to stir until temperature lowers. 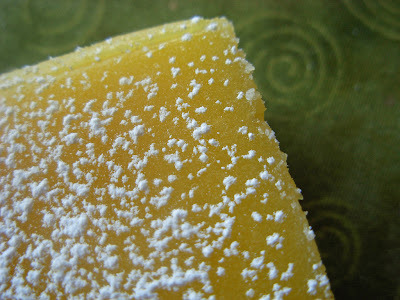 Curd is done when a wooden spoon swiped in the mixture is thickly colored yellow. Remove from heat and quickly pour contents through a large strainer into a non-reactive bowl, pressing the solids then discarding them. Stir in lemon zest. 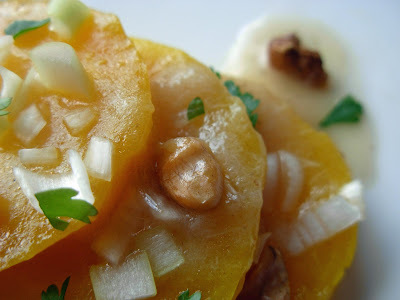 This post is my submission to Barbara, of Winos and Foodies, who is hosting A Taste of Yellow - LIVESTRONG, a food blog event honoring and remembering those whose lives have been affected by cancer.